Woodblock printing, as its name suggests, made use of Chinese boxwood block and mulberry paper to transfer an inked image on an intricately cut woodblock to paper. 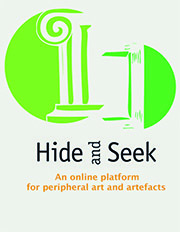 It was suitable for black and white newspaper publications and allowed artists to simplify the complexities of a story to woodblock size for the illiterate masses. In the 1950s and 1960s, woodblock prints were a popular medium of social and political expression in Singapore. Though the Second World War and Japanese Occupation have ended, economic and social problems persisted as the people in Singapore struggled to find food, work and proper housing. The reality of post-war hardships was often depicted in the social realist art style of woodblock prints. 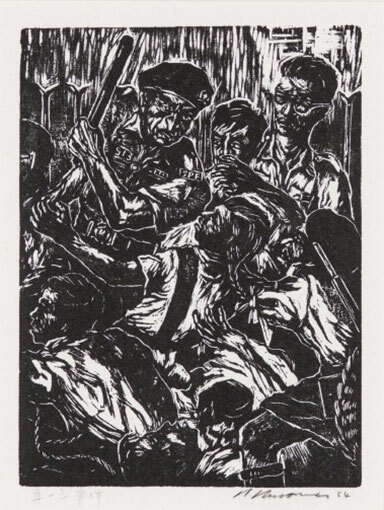 The prints also reflected the post-war political situation in Singapore, which saw a growing desire for political liberation from British colonial rule. The increased national consciousness in Singapore was set against the larger wave of decolonisation that was sweeping through Asia and Africa. 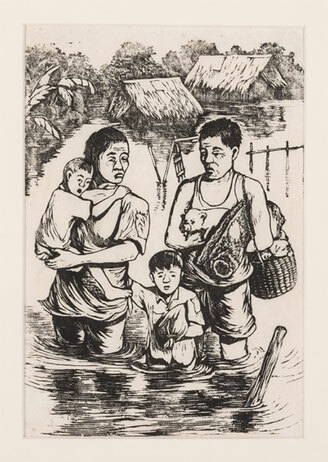 In Flood at Potong Pasir by local artist Koeh Sia Yong, the theme of loss is explored as the print portrays a family fleeing a flood, worry etched on the parents’ faces. In the 1950s, Potong Pasir was an area in Singapore with many vegetable farms that were vulnerable to frequent floods. Koeh might have made this woodcut in reference to the Potong Pasir floods of the early 1950s, which left hundreds of families stranded and destroyed crops, resulting in substantial losses of poultry and food for farmers. Another local artist, Choo Keng Kwang, made the woodblock print titled 5-1-3 that captures the political tensions of the day. The title refers to 13 May 1954, when Chinese middle school students in Singapore protested against the military conscription of all males between the ages of 18 to 20 years, as required by the 1952 National Service Bill. The students felt this was unfair as it required them to defend the British colonial government who had not provided for the advancement of Chinese education. This is the artist’s impression of the clash between the students and police, which turned violent and led to 26 people injured and 45 students arrested.